As your City Councillor I will fight to see the Waterfront West LRT plan brought back to connect our neighbourhood with Toronto's downtown in a faster and easier direct route. I will work to integrate GO Transit and TTC routes within the city so that people can use the Lakeshore GO line as if it was a subway. If Tallinn (the capital of Estonia) and other cities in the world can have FREE or truly affordable transit, so can Toronto! -Another preview from our main campaign leaflet coming this fall! We are Torontonians NOT taxpayers! Say NO to the corporate agenda of service & wage cuts! A large part of the corporate agenda of service cuts, privatization and stopping government from taking action on issues like poverty and inequality is the myth that taxes are too high and that our governments have a spending problem as opposed to what they really have, which is a revenue problem! By constantly pushing to cut taxes or to keep taxes low for corporations or the rich, the right-wing hopes to rob governments and the people of the ability to build new programs and a more just and inclusive Toronto. Unwilling to stand up to the corporate tax cutting agenda, "mainstream", do-nothing politicians use slogans of "fiscal responsibility" to claim that important programs like free transit, building affordable housing, living wage ordinances, ending user fees and so many others are not possible, even though they ARE possible and exist elsewhere! But they are not possible if we continue to pander to the business community, the wealthy and their lobbyists. 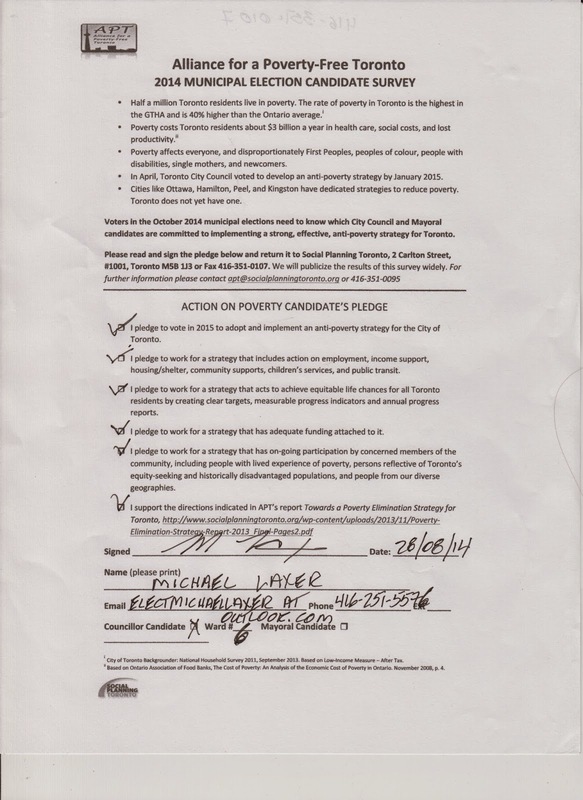 I made it clear that that is not where I stand, and responded with answers that reflect my belief that we are Torontonians and a community and that this is not defined by the word "taxpayer"! No. This is a terrible idea given the many programs and infrastructure needs facing the city. I do, however, support mitigating property tax hikes by working for the implementation of a city progressive income tax, creating a property surtax on the luxury homes of the wealthy and through the imposition of road tolls on non-residents entering the city by car, among other things. I do not regard this as a priority. Rob Ford's gravy train turned out to be a myth, as I predicted in 2010, and searching out so-called "waste" really usually means cutting programs. 3. 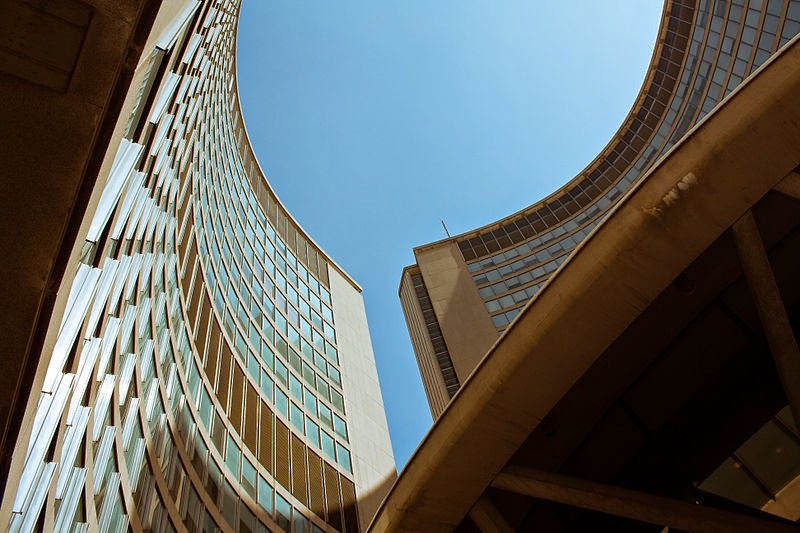 Do you support reducing the size of Toronto City Council? Do you believe this would improve how Council operates? No. Reducing the size of City Council means reducing political representation and power for Torontonians and our diverse local communities and neighbourhoods. Why would anyone support this? 4. Will you support contracting out garbage collection east of Yonge Street? Are there other services you feel contracting out would give taxpayers a better deal? 5. What are your thoughts on the Municipal Land Transfer Tax - will you support reducing it or eliminating it? 6. Toronto's unemployment rate is much higher than the provincial rate. What are your ideas to create job growth in Toronto? We need a job creation plan centred around the building of new infrastructure and transit (both of which would create many new, good-paying jobs), new city programs and services and the stimulus to the local economy that would result from bringing in a municipal minimum wage of $15 an hour and a Living Wage Ordinance. Workers, unlike the well-to-do and the wealthy, spend most of their income on food, services, entertainment, etc and do so in their local communities. The is no better job creation stimulus plan than living wages for all! I believe in using dedicated revenue streams such as the ones listed above to fund transit expansion as well as a universal fare reduction strategy with the goal of free transit as exists in Tallinn, Estonia. I will fight to get the province and federal government to pay their fair share of this, in part by diverting funds used to subsidize car usage. I also believe that LRTs provide better service for far less money for most (though not all) neighbourhoods and I would support reverting to the original plan for a Scarborough LRT. 8. Labour negotiations will be a big part of the next council term. What advice do you have for the city's negotiating team to get the best deal for taxpayers? I am opposed to the disgraceful race-to-the-bottom wage cutting agenda of Bay St. City workers work hard and deserve fair and regular wage and benefit increases. No one in the community benefits when wages are cut and money is taken out of the economy. Transit. 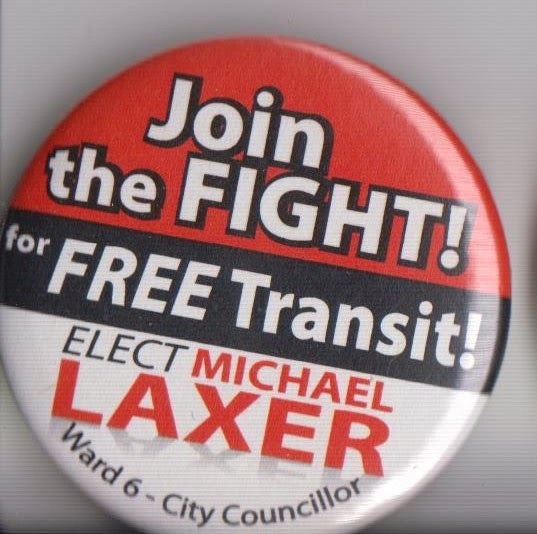 As Councillor I will work to bring back the Waterfront West LRT plan for our community and for an affordable transit fare agenda for the TTC whose goal would be free transit. Needless to say, I do not anticipate their endorsement. Toronto needs a new agenda for the city. An optimistic agenda centred around community and collective goals and that does not accept the destructive agenda of corporations or the do-nothing excuses of the well-payed "mainstream' politicians or want-to-be politicians. This agenda is the opposite of the cruel and ugly agenda of constant cutbacks and accepting poverty wages and poverty in our communities that we have now.